From Akick Watermark Creator: Are you looking for software that can help you out to create a unique logo, text for the copyright of your own? 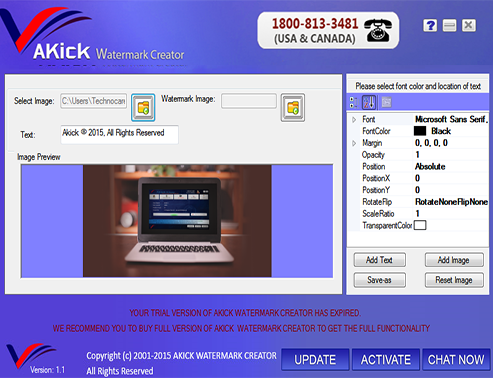 It seems like that, you need to look no further that Akick Watermark Creator Tool, and it is specifically designed to make your document absolutely different. However, today, online resources even not safe. The watermark is a text or image that makes user's logo, pictures unique so that they cannot be imitated or copied by unknown users. It is mostly used by business and professionals so as to protect their work from any duplication. The large number of the image can be watermarked in a single click away, thanks to Akick Watermark Creator software that provide you the best way while creating unique one image. You need to create your own logo, text, image for better identification this tool meets your exact requirement while you can easily make your own image in an easier way. Since, this software is armed with many good quality features that allow you to use in a simple way at the different operating system. Easy Installation: This software provides you the user-friendly interface so that any novice users can easily use it without error. Even installing this software would be simpler than you think. At your few clicks, you can install it in your PC. Unique logo quickly: While using this free tool you can create dozens of logo, image quickly. In addition, with using this software you can easily save your image for its future use. Option for font and color: You can make a beautiful watermark by changing multi-option, such as font, transparent, angle, shadow, brush texture and more. The choice is yours; this software provides you the excellent command that you can change your font and even created text color. Or whatever you want to do with the help of this tool. Compatibility: No matter! What operating system is in your hands, this software is easy compatible with the latest version of operating system such as 8/7/Vista/XP. nanoCAD Plus - nanoCAD Plus - easy-to-use low cost CAD software providing classic interface and native .dwg support. nanoCAD Plus has been built to deliver design and project documentation regardless of the industry or enterprise. SRDx Photoshop Plugin Mac - Photoshop Plugin for macOS 10.10 and later or Win7 and later for time and work efficient Dust and Scratch Removal. Automatic Detection and Correction, highly adjustable. No Blur Effect. Photoshop CS4-6 and later. Photoshop Elements 14 and later. Canvas Draw for Mac - Visualize your workflow with a diverse content creation tool able to combine adaptable text, image, object, and effect elements in a single document. InPixio Free Photo Editor - Easy to use! Add Filters & Effects: turn your photos into artwork! Cut & Crop: Change the Focus and Size of your photos. Editing: Change the Color & Brightness Enhance your photos with frames & designs. Share your photos on Facebook! Q2ID - Q2ID is an InDesign plugin to quickly convert QuarkXPress documents in Adobe InDesign. No more re-creating documents from scratch. The Q2ID InDesign plugin gives you a big head-start on QuarkXPress to InDesign data conversion. Nero CoverDesigner - Nero Cover Designer is a user-friendly program for creating and designing individual covers and labels. You can use your own ideas to create CD,DVD,BD covers and booklets, or you can import covers from scanners, digital cameras, or the Internet. CADbro - CADbro is a budget-friendly 3D CAD viewer with multi-CAD format support, especially designed for everyone to visualize and communicate engineering data. WidsMob HDR - WidsMob HDR Plus recreate HDR effects as eye view with 3 bracketed images in JPEG and RAW formats. It also provides customize HDR Photos Parameters and even HDR effect presets. Photopus Pro - Easy to use software for photo conversion, watermarking, size adjustment, file rename, transform, touch-up, apply effects, and lots more!